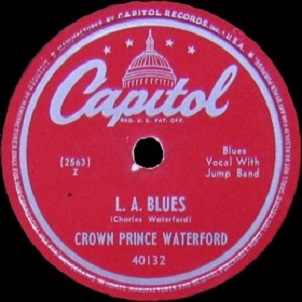 In Capitol Records’ initial foray into the realm of rock ‘n’ roll the major record label unaccustomed to dealing with such low brow music seemed to take steps to minimize the potential fallout should they let their designated signee, the ever unpredictable Crown Prince Waterford, run roughshod in the studio leaving them with few options. For starters they enlisted a top notch band led by saxophonist Maxwell Davis and augmented by pianist Pete Johnson and guitarist Tiny Webb, all solid professionals yet who were more than capable of delivering the goods when it came to authentic rock ‘n’ roll, hoping they’d be able to keep the Crown Prince reasonably focused. They then gave him a rather rare double session, meaning that instead of three hours to cut four songs, and thus two singles, they’d go to the expense of booking studio time and paying musicians twice that in order to get as many songs out of Waterford as they could – not necessarily because they wanted more singles, but rather I think because they didn’t want to be forced into releasing something inappropriate or out and out salacious simply because they had no other options as might’ve happened if they’d only cut four tracks. When all was said and done and the eight tunes were in the can Capitol then went about releasing them in a very methodical and well-planned manner, pairing an uptempo barn-burner that allowed him to unleash his boundless energy and enthusiasm – and his often questionable topics – with a more subdued introspective song, preferably a ballad that tapped into the musical structure and mood of older genres in an attempt to placate if not win over the label’s more typical record buyers. It was a sound strategy that showed a surprising degree of caution and foresight. There was only one problem – Crown Prince Waterford rarely had the self-control to follow any plan through to fruition. What’s becoming clearer the more both sides of Waterford’s Capitol releases are examined, is just how necessary this level of micro-managing was to keep things from blowing up completely. We don’t have any idea who was in the studio for the company, whether it was a hands-on producer or whether it was just somebody overseeing the session but letting Maxwell Davis run things. Whoever it was though they seemed to have a surprisingly firm grip on the kind of material – and type of accompaniment for that material – best suited for Waterford’s strengths. This may seem to be something that a record label should have no trouble doing, it’s their job to do so after all, but as we know by now that’s not always the case when it comes to high class companies trying to slum in rock ‘n’ roll. The best comparison between what Capitol was able to extract from Crown Prince Waterford, hardly the most disciplined or artistically talented artist in the world, is found with what MGM, another moneyed company with Hollywood ties aspiring to be a “major label” as Capitol had done just a few years earlier, would soon try and do with Big Joe Turner. Turner of course was a FAR better singer and writer than Waterford for starters. He was also more conversant in all of the dominant styles of the past decade as well as a natural fit for rock ‘n’ roll which would go on to define the next decade of his career. Waterford too had experience in different genres from the recent past and was showing he was well-suited for rock, but far more than Turner he struggled with basic issues of pacing and control when it came to harnessing his singing. That would seem to make MGM’s task when they brought Turner in much easier than what Capitol was dealing with in the case of Waterford. Now throw in the fact that the sessionists MGM hired to back Turner were comprised of the same guys the Crown Prince was using here, with Maxwell Davis and Pete Johnson at their core. Davis was amenable to all sorts of styles and had an intuitive sense of what would and wouldn’t work with an artist that would serve him well when he soon made a name for himself as the top West Coast producer in all of music. Meanwhile Johnson had known Joe and worked with him since they were teenagers and then when they launched the national boogie woogie craze together in the late 1930’s and they’d recorded with one another on and off ever since, so if any two figures were compatible it’d be them, or so you’d think. Yet the MGM cuts Turner released, as we’ll see over the next year, were often frustrating because there was no real sense that anyone involved had a definite game plan heading into them. Songs best suited for one tempo were played at half that speed… songs with downcast lyrics were played as if they were celebratory… those which reached back to older motifs contained attributes that were from a more modern vein and thus they satisfied neither the remaining audience for that brand of music nor the budding rock consumer. By contrast Waterford’s output with Capitol thus far shows a company that had a clear vision with how he should be presented and made sure the session musicians were on the same page as the producer so that all of the parts fit. In spite of that diligence however L.A. Blues puts that plan to the ultimate test because the Crown Prince, as was his instinct, took what was designed to be a ballad and injects it with more liveliness than might be advisable. Yet thanks to whomever was minding the store in the studio they somehow keep it from blowing up in their faces all the same. You get the sense the way the song unfolds that the concept behind the song was to provide a third party glimpse into the Central Avenue scene in Los Angeles of the 1940’s, which truthfully is one that everyone should be privy to if you want to see a vibrant self-contained and thriving black community in a time of outright segregation and discrimination. The musical setting on L.A. Blues is established by Johnson on piano who delivers sort of a detached wistful intro, one that could serve as the music for a black and white silent movie of the scene about to be described. It’s nostalgic in a way, even though Central Avenue’s heyday was still going strong when this was cut, almost a bit melancholy too, as if the pride in having someplace to call your own shangri las was offset by the fact you actually needed one because no other part of your own city would welcome you with open arms. Waterford for his part matches this mood… at least to begin with, though this might be because he’s somewhat off-mic when he starts singing. Could this be intentional? It’s certainly possible. It does render his opening lines more effective as they seem to be similarly coming from a hazy indeterminate time and place, almost like somebody singing from beyond the grave or when looking back at such a scene years down the road. But considering WHO is doing the singing it also raises two other conflicting possibilities. The first is that the producers realized Waterford was prone to over-singing, raising his voice unnecessarily too often which would override the reflective aura they were going for and by keeping him from overwhelming the microphone with his bellowing they were hoping to maintain that atmosphere whether he liked it or not. Waterford though might’ve realized he was in danger of not being fully heard, or at least not heard enough to his liking, and that in turn got him to veer off course and toss aside the game plan as he does once he reaches the second stanza and his voice inevitably begins to rise. Watch out! Here comes the irrepressible Crown Prince, storming through the studio in search of a song to bludgeon to death. Yes, it’s true that Waterford has no sense of self-control when it comes to how to project his voice. Maybe he’s hard of hearing or grew up with somebody who was, and yes that failure to modulate his vocals alters a lot of what he’s saying simply by HOW he’s saying it, or screaming it as it were. That’s unfortunate, because the song he wrote, while fairly clichéd at times does take on the right confidently defiant tone. He even tosses in the line ”If a man can make it in Los Angeles, he can make it anywhere” which was appropriated and slightly homogenized, for a different city on the East Coast some thirty years later when Frank Sinatra sang New York, New York. Though Ol’ Blue Eyes didn’t write that song he later made famous, he was fairly hip back in the 1940’s and might’ve gotten wise to the line when Waterford introduced it and from there, who knows? At any rate, L.A. Blues paints a fairly colorful picture here, tossing in playful asides along the way, the best of which is advising those thinking of making the scene that they need ”one of those used Cadillac cars”, and telling the guys headed out to ”bring their own women along”. But he also wanders off into some rather pointless lyrics about chicken and gravy that don’t convey anything interesting other than what he had for dinner the night before. Thankfully he’s got solid support on this guided tour around town, as Davis in particular chimes in with some interesting sax lines, one of which has you thinking he’s playing harmonica at first which gives it a down-home feeling for just a second before he eases out of that odd tone and into one more suited for the brass instrument he’s playing. As he winds his way around Johnson’s stabbing piano lines we hear Waterford unable to contain himself in the background yell out but by now it’s all atmospheric anyway. Unfortunately the weakest part of that atmosphere is the Crown Prince himself. Too rambunctious for the aural mood the others create, his inconsistency in his vocal performance never lets this fully settle into what otherwise might’ve been a very clear and detailed snapshot of a world that would soon cease to exist, the regrettable end of which we delved into in much greater depth on Amos Milburn’s A&M Blues. At the time of course nobody figured it would ever be first curtailed and then vindictively done away with by the white Los Angeles power structure, but the musicians themselves seemed to have had a pretty good portend of its eventual fate when judging them by the manner in which they delivered their parts, making L.A. Blues something of a musical elegy for the world they knew so well. But in many ways this record is less about the fate of the Central Ave. night life than it is the fate of its singer. Capitol Records, the only major label on the West Coast for what that’s worth, seemed to want him toning things down a bit to act as a counterweight to his barreling enthusiasm on Strange Woman’s Boogie on the top side and while I’m sure they were reasonably satisfied with the results of this and clearly took great steps in the studio to make sure they got something on tape that was suitable for this role, you can see how difficult that task was when dealing with somebody as single-mindedly obstinate in his technique as Crown Prince Waterford. This is still a good record, a very interesting one for sure, and for the most part it minimizes Waterford’s shortcomings, but it’s those same shortcomings which keep it, and the Crown Prince himself for that matter, from ever surpassing expectations. Leave a reply on "Crown Prince Waterford: “L.A. Blues”"